The video, sent to officials in the US, is the first proof in more than three years that Bowe Berghdal is still alive. 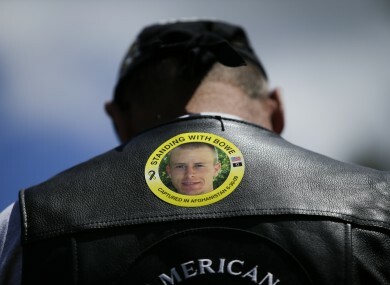 A supporter at a rally to support the parents of Bowe Bergdahl in a small town in Idaho in June. THE UNITED STATES has obtained a “proof of life” video of US soldier Bowe Bergdahl, who has been held captive by Afghan insurgents since 2009, a senior official has confirmed. It was the first video providing proof Bergdahl was still alive in more than three years. The US Army sergeant is the only American soldier held captive by Taliban militants. “We received a proof of life video,” the official, who spoke on condition of anonymity, said. The video shows a frail Bergdahl making a reference to the recent death of South African leader Nelson Mandela, according to NBC News, citing unnamed officials. In September, US Defence Secretary Chuck Hagel promised to keep up efforts to win Bergdahl’s safe release. The soldier disappeared in June 2009 from a base in eastern Paktika province and the Taliban later said they had captured him. US officials at one point considered a possible swap in which Bergdahl would be let go in exchange for the release of Taliban members held at the US-run prison in Guantanamo Bay, Cuba. But the deal was never clinched. Email “New video shows only American soldier still held by Taliban is alive”. Feedback on “New video shows only American soldier still held by Taliban is alive”.